As I just said, we integrated with Hive. We are not only use Hive meta store, also use HiveQL. However, HiveQL is using MapReduce which brings some performance issues. We decided to not use MapReduce. We replace MapReduces in Hive to HBase coprocessors. We call the language “HareQL”. HareQL has some advantages as below. 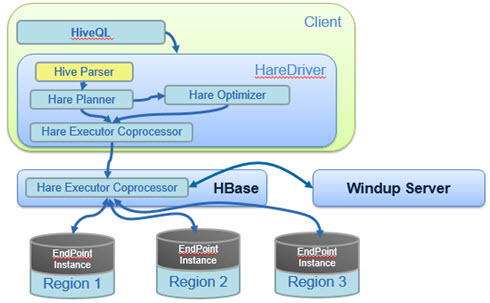 Here is the architecture of HareQL. We make use of Hive Parser which make us can support HiveQL and we replaced the other part of Hive.